A silver comb of typical form with arched top and flared sides. The front is engraved and decorated partly in repoussé with a moth, which is outlined in gilding. The moth faces downwards and spreads its wings. The repoussé body, the wings and the antennae of the moth are incised with linear patterns in well-defined detail. The lower part of the comb consists of a row of finely carved teeth of equal length. The back of the comb is unadorned and slightly concave. 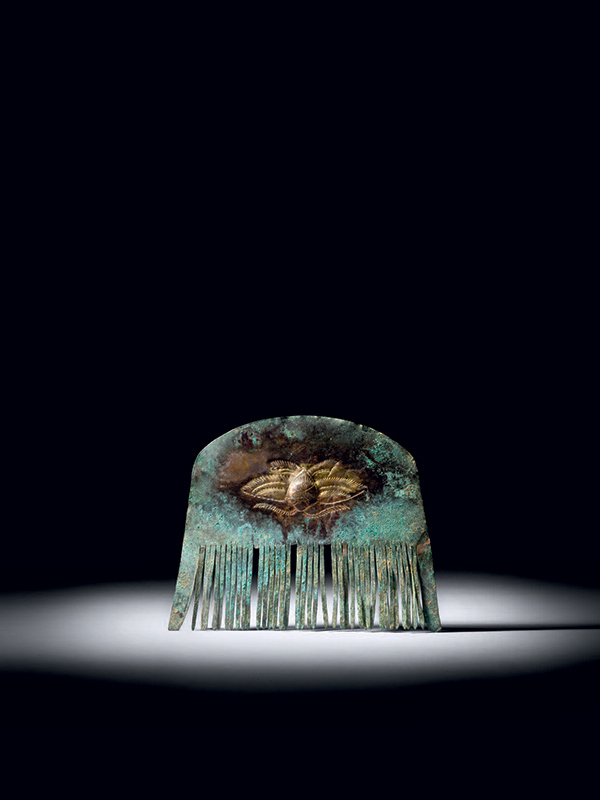 Both the front and the back of the comb have acquired a greyish-green patina, showing small areas of malachite encrustation. Tang dynasty combs are generally categorized as two different types: jie and shu. The shu was a functional comb for brushing hair, while the jie was a thinly cast ornamental comb such as the present one. Fashionable Tang women wore their hair in elaborate coiffures, often adorned with as many as a dozen gold or silver jie. The fashion for such styles is described in a poem of the Tang dynasty: “Her entire head was covered with rows of tiny combs”. A Tang dynasty openwork silver comb also decorated with a central design of a moth is in the Mengdiexuan Collection. [3 ]Another comparable tinned and gilded bronze comb, similar in shape but decorated with three magpies among floral sprays, is also in the Mengdiexuan Collection. Two further comparable gilded silver combs, each with two birds decorating the top, are in the Muwen Tang Collection.